For investors looking for huge returns, pharmaceutical stocks may well be the answer. While these stocks are inevitably risky with a lot riding on key clinical results, if trials succeed, the results can be spectacular. 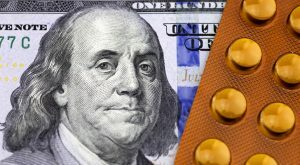 Smaller stocks can also be snapped up by big pharma — see the $12 billion purchase of Kite Pharma Inc (NASDAQ:KITE) by Gilead Sciences, Inc. (NASDAQ:GILD) which caused KITE shares to rise by 29%. But the riskier the stock, the more important it becomes to check all possible data signals. Here we used TipRanks stock screener to pinpoint healthcare stocks with a ‘Strong Buy’ analyst consensus rating. Applying these filters (Strong Buy, healthcare sector) led to an extensive list of hot stocks. You can easily hone in on stocks that stand out from the crowd by looking at the average analyst price target. I scanned for stocks with recent buy ratings and upside potential of over 100%. TherapeuticsMD Inc (NYSEMKT:TXMD) is a unique biotech making waves in the world of female healthcare. The company develops and commercializes products exclusively for women. This approach clearly has the backing of the Street, as TXMD has a Strong Buy analyst consensus rating. In fact, in the last three months, TherapeuticsMD has received five back-to-back buy ratings. Meanwhile the $19.50 average analyst price target represents a huge 225% upside from the $6 current share price. Crucially even the lowest price target of $10 from Oppenheimer’s Jay Olson on Aug. 29 still suggests huge upside potential of 67%. The most bullish analyst of the pack is top Cantor Fitzgerald analyst William Tanner. He reiterated his TXMD buy rating on Aug. 14 with a $33 price target. This works out at huge 450% upside potential. Crucially, the analyst demonstrates a strong track record on the stock with a 78% success rate and 11.2% average return. Tanner says TXMD’s lead product candidate, a TX-004 soft gel capsule “could be approved, with a Class 1 review (two months), in early 2018.” The approval relies on the current review of additional information by the Food and Drug Administration, which could come as soon as Nov. 3. Tanner concludes that “a dimly lit path is becoming brighter.” He adds that the extra information requested by the FDA surrounds a lack of long-term endometrial safety data and not more fundamental concerns on chemistry, efficacy or manufacturing. And encouragingly, a Deutsche Bank-commissioned survey of 525 women showed a healthy TX-004 uptake among current Rx users, who appeared happy to switch to a new prescription if recommended by the doctor. A clinical stage biopharma, Global Blood Therapeutics Inc (NASDAQ:GBT) is a top stock to track right now. GBT focuses on developing and commercializing novel therapeutics for serious blood-based disorders with significant unmet need. At the moment, GBT is developing its lead product candidate, GBT440, for the treatment of sickle cell disease and pulmonary fibrosis. The Street is very bullish on the stock’s prospects. GBT has five buy ratings from analysts — all in the last three months, and no hold or sell ratings. We can also see that the stock has a $60.67 average analyst 12-month price target. Given that the stock is trading at $28.10, this works out at huge upside potential of 116%. The third stock is Iovance Biotherapeutics Inc (NASDAQ:IOVA), which analysts say is ‘underappreciated’. From Aug. 16, the stock has been climbing from $4.55 up to the current share price of $5.90. Analysts believe IOVA can reach $15 in the next 12 months (156% upside). The company develops and commercializes novel cancer immunotherapies based on tumor infiltrating lymphocytes (TIL). IOVA has received five straight buy ratings in the last three months making it a ‘Strong Buy’ stock. If we dive into the individual analyst ratings we can see the analyst track records on IOVA stock specifically. Here, as with TXMD and GBT, the most bullish analyst (Chardan Capital’s Madhu Kumar) has a strong track record on the stock (75% success rate, 10.4% average return). His $20 price target on IOVA works out at an incredible 242% upside potential. Article printed from InvestorPlace Media, https://investorplace.com/2017/09/3-soaring-pharmaceutical-stocks-double-iova-txmd-gbt/.